That key does not work on this platform. It's a Windows license key,not mac!! that replacement did the trick... thanks!!! bravo!! Worked for MacOS Sierra! It works in MacOS! excellent!! 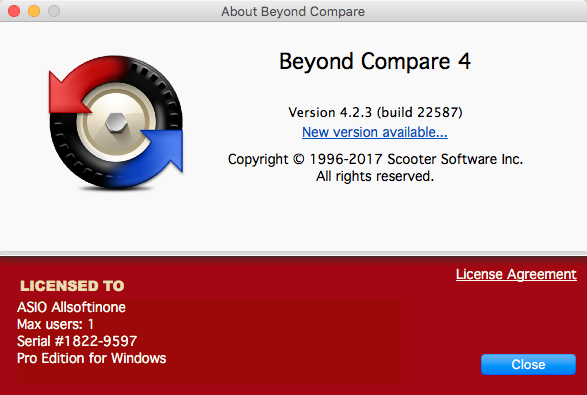 It works in macOs Sierra 10.12.6, Byond compare Version 4.2.2 (build 22384)! it works on windows 4.2.2 64bit. thanks. Thans @o0oKodako0o. I have already actived by his way. That's a esaier and wonderful things. Tested on Version 4.2.3 (build 22587), probably won't work on other builds. Don't forget to disable the repository afterwards so you don't get automatic updates. 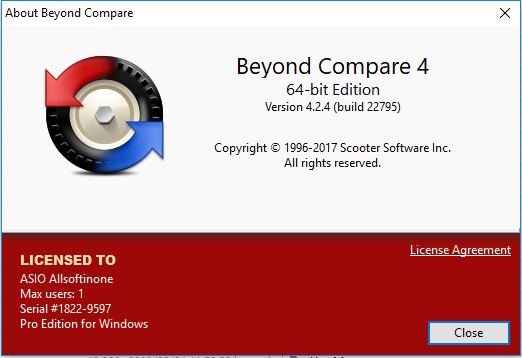 thinks,Windows Beyond compare 4.2.3 is ok.
Windows Beyond Version 4.2.2 (build 22384) online is OK. Thanks very much. Great! Worked well on Version 4.2.3 for MacOS 10.13! Activated successfully on Version 4.2.2.22384 for Win10. Thanks a lot. Thanks! 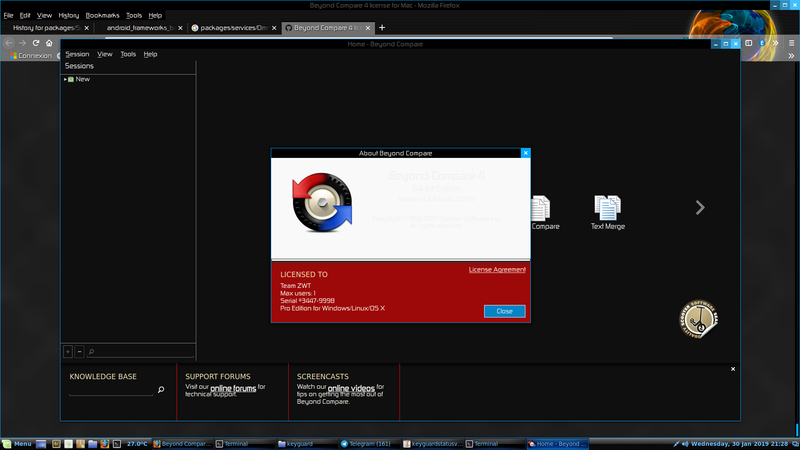 Version 4.2.3 on Win7 is work. thank you very much, i am successed to activite it. It works on 4.2.1, thx! Poster is a good people. Thanks, man, it works fine on Windows 10. I was also able to use it for 4.2.3 on Windows, it's surprisingly still working. Thank you SO MUCH for sharing! It still works with v4.2.3, thanks a lot ! mac 4.2.4 fail， said platform is wrong. Mac 4.2.4 failed, Trial mode error. The same failure. 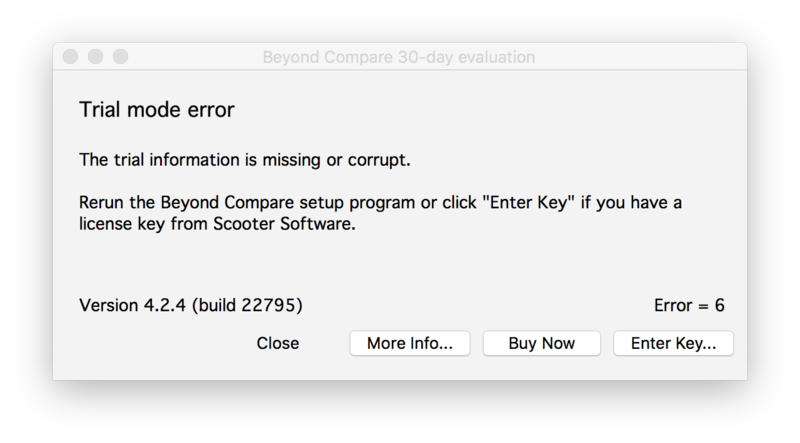 "Trial mode error" with Beyond Compare 4.2.4 on Mac OS High Sierra 10.13.3. It worked , thanks . Revoked :( Had to update to 4.2.4 (build 22795) but doesn't work anymore..
Works in macOS Hign Sierra 10.13.4 with version 4.2.2 (build 22384). You can follow the following page to disable network for BC. Version 4.2.4 (build 22795) successful..!! Thanks. thanks @TanguyOrtegat. Works well with 4.2.3 on macOSX. 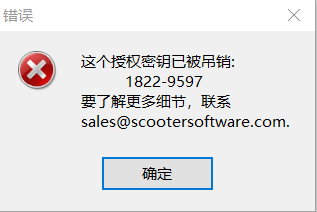 Thanks, Still work with 4.2.4 on Win10. Have a nice days guys. 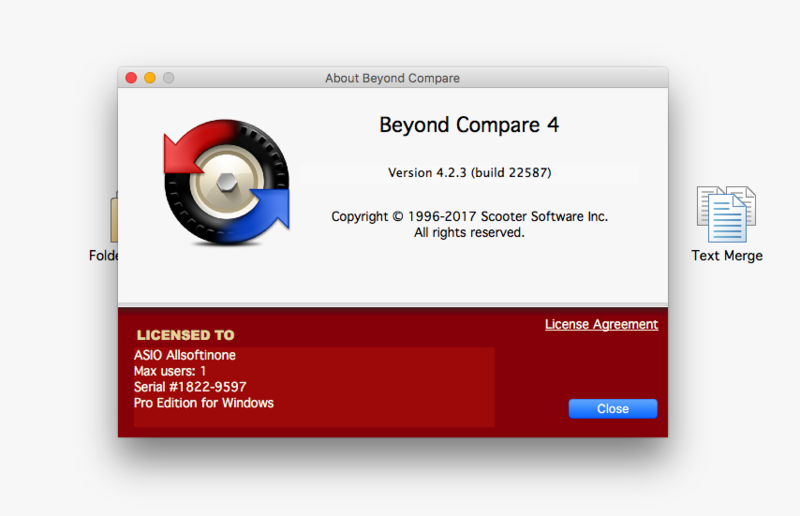 works for mac beyond compare 4.23, great appreciate! Works for Beyond Compare 4.2.5 build 23088. @icelemon1314 thx for the correct answer! it seems doesn't work because this license has been revoked. @duykhanh1411, gracias me ha funcionado esta solución. It Works.. Thanks a lot!!!!! 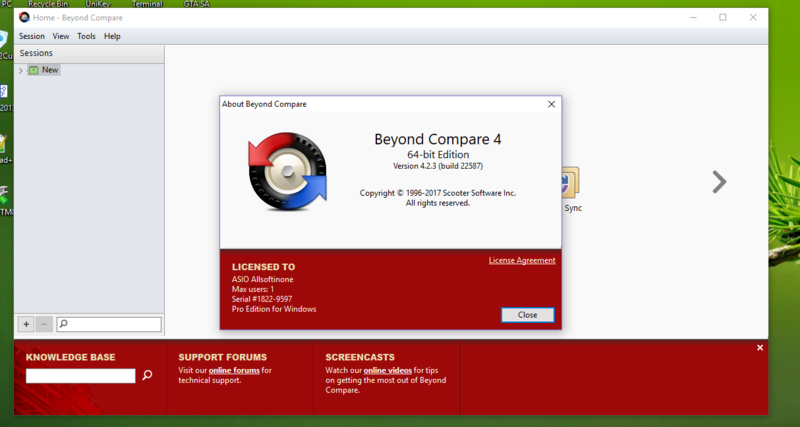 BC: 4.2.4 on Linux Mint....worked like a charm. how to use permanent trial on Linux? 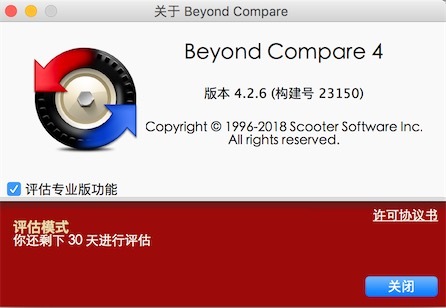 BC 4.2.9 for mac failed,any idea?